This lovely condo has all the comforts of home. The unit has 2 bedrooms and 2 full baths, a large kitchen with full size appliances including a dishwasher and all the dishes and utensils needed to cook meals and save a lot of money. Stove, convection oven, full size refrigerator/w Ice maker, Coffee maker, and toaster, Rice cooker, Blender, Microwave, cooking utensils, silver ware etc.. The unit has free high speed wireless WiFi. 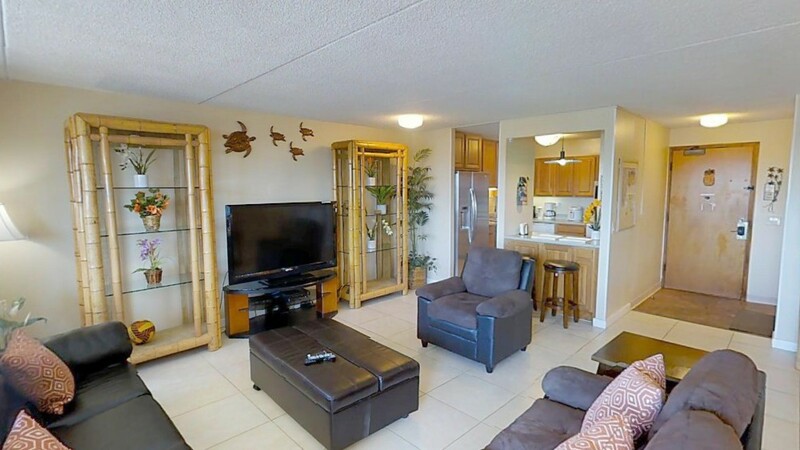 The condo has an awesome ocean view with two large lanais where you can enjoy the sunrise and the sunsets everyday. You can walk to the beach and all Waikiki attractions. The master bedroom has 2 Queen size beds, the second bedroom has one queen bed and 2 twin bunk beds, and the living room has one large sofa for one person to sleep if needed, and a roll-away bed can be furnished if requested. You will have a free parking stall in the building so you can drive around the island and visit all the sights that you want to see on your vacation. The condo also has a dishwasher and a washer and dryer inside the condo. The convenience of this condo can't be beat. The condo is furnished in and island themed decor with nice comfortable furniture in all the rooms. You will enjoy being able to relax and be comfortable while taking advantage of the activities and places to see on the island. This will be a vacation to remember. The Royal Kuhio Bldg. has a huge recreation deck with a large ‘L’ shape swimming pool, Sauna, BBQ area, tennis courts, exercise room, playground, Gym with Bathrooms, Ping pong & Pool tables, plus has a large coin operated laundry room and lounging area. on the 7th floor.